The Chief RSAUS Mini RPA Projector Mount builds on the foundation of the highly successful RPA mount, offering a compact design and smaller form factor which supports the trend towards sophisticated technology in a small package. 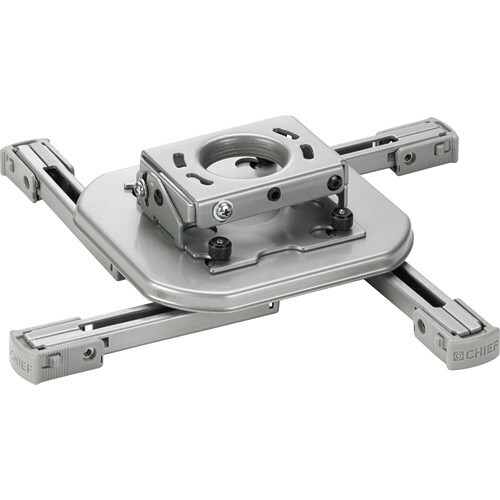 Although 33% smaller than the RPA, this mini mount retains much of the functionality of the larger mount, with independent roll, pitch and yaw adjustments for quick and precise projector registration and a 25 lb capacity. Shipped fully assembled, the RSAUS is also quick to connect or disconnect for lamp or filter changes while maintaining precise enough remounting to ensure that registration and preset adjustments remain unaffected. The RSAUS offers flexible installation options including ceiling flush mounting, 6.35 mm threaded rods or 1.5" NPT threaded extension columns. The included universal fits most projectors. Compact design is smaller than the RPA Elite by 1/3 and includes all the same features. Independent roll, pitch and yaw for quick and precise projector registration. Quick connect/disconnect with convenient lamp and filter access on most projectors. Disconnecting maintains registration and doesn't affect preset adjustments. Multiple installation options including: flush mount to ceiling, use 0.25" threaded rods, or use a 1.5" NPT column. Now includes new universal interface to further reduce installation time.